Say thank you to your child's teacher! Listing is a Teacher Apple berry wreath wall hanging using a burgundy berry wreath, salt dough ornament and burgundy homespun bow hot glued securely to the wreath. Wreath measures 12" diameter, salt dough ornament is wired in the center and measures 3 1/2" wide and tall. 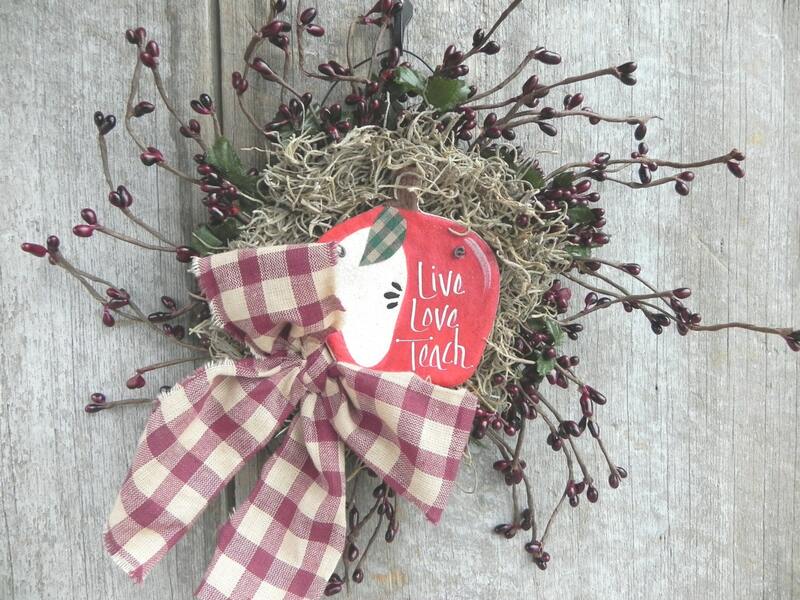 Ornament is hand painted salt dough apple and is inscribed with "Live Love Teach". Sealed with a hand brushed coat of polyurethane and wired securely to the wreath. Berry wreath has artificial burgundy berries and a touch of green silk leaves.